See the gallery of photographs from the New York Trip by clicking here. 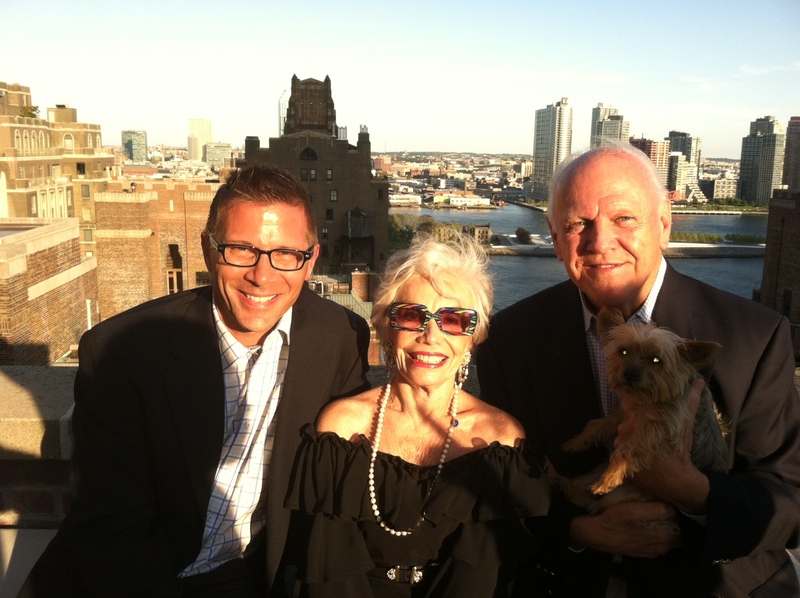 Carol Channing proved last night (after a three year hiatus from the stage) that she could still perform, get laughs, and a standing ovation. 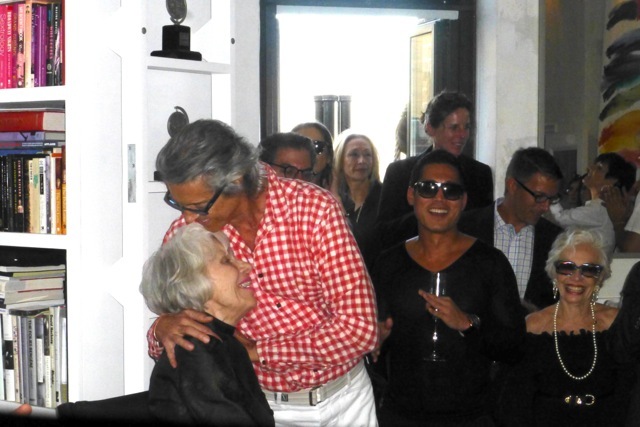 After her heart warming and hilarious performance the night before at the Ice Palace in Fire Island, her friend Tommy Tune had proclaimed “She’s back!” And now we would soon be off to New York City and the party at Tune’s Manhattan apartment to welcome Carol back to Broadway. I awakened about 7 a.m. Peter Glebo came upstairs with his cup of coffee which prompted me to go downstairs in my robe for coffee. Carol and Sylvia Long were at the dining room table in their pajamas and Gary Hall, Jerry Green, Isabel Kaplan (Carol’s Goddaughter) and Wayne Gmitter were in the living room. Carol looked at me as I walked over to the table, “Oh it’s the little one!” she exclaimed. “That’s because I keep getting smaller,” I answered. Carol raved about the man who had come in from Manhattan to do her make up before the show, and Justin Vivien’s questions during the performance. “She made me look good,” she said. Sylvia made scrambled eggs, toast, and crisp bacon for all of us. Peter came downstairs with his and Tommy Tune’s luggage. They had to leave early to prepare for the party that night honoring Carol. After breakfast Carol sat on one of the couches, still in her cute checkered pajamas. She closed her eyes. A few minutes later Tommy came downstairs. He walked behind the couch where the 92 year old super star had now fallen asleep. He gently kissed Carol on the forehead. And then he, Peter and Wayne left for New York. Jerry, Gary, and I walked to the wharf to catch the 11:45 ferry from Cherry Grove. It was crowded with people coming from and going to the ferry. A few minutes later the golf cart arrived with Carol, Sylvia, Harlan, and Isabel. The entire scene changed. It had been quiet – suddenly there was excitement as everyone there seemed to crowd around the cart. People of all ages surrounded Carol to take photographs and many asked to be photographed with her. Carol obliged with her familiar big smile. People hung over the railing of the ferry’s upper deck with their small cameras and smart phones to photograph the legend. And again, the locals thanked her and told her how thrilled they were to have had her in Fire Island. A loud speaker on the dock played “Hello Dolly!” as we boarded the ferry. Sylvia insisted that I cancel my Manhattan hotel reservation and stay with them in their suite at the Waldorf Astoria. And what a suite it was – in the Tower – three bedrooms, a large living room (with fireplace), huge dining room (with fireplace) and a professional sized kitchen. What a blast! I learned that when Carol was starring on Broadway, she, her husband and son all lived in a similar suite. Tommy has a penthouse. We took an elevator and then walked up 21 steps to reach his modern apartment. It opens to a huge outdoor terrace that surrounds his living space with spectacular Manhattan views, the most spectacular overlooking the East River. On a landing half way up the stairs is a huge wall covered with Andy Warhol renditions of Carol – from floor to ceiling. How Carol, who had been confined to a wheelchair only a few months earlier, made all those stairs, I will never know. It is a sign of her determination – the determination and drive that first made her a great star and continues today. The party was co-hosted by Tune with Peter Glebo, Gloria Naftali and Think Iconic Agency. Guests were gathered on the terrace including Lorna Luft (first person I ran into). Lorna was excited about teaming with her sister, Liza Minnelli, for a New York benefit Oct. 14 and 21 at Birdland in New York to raise funds to fight breast cancer. “The last time we performed together was during the Tony Awards in 1993,” Lorna said. “Can you imagine – we haven’t worked together for 20 years.” She was obviously excited about the on stage reunion with her sister. Lucie Arnaz arrived with a VHS copy of a television show that Carol made with Lucie’s father, Desi Arnaz. She gave it to Carol who was happy to receive it. Lucie appears at the McCallum Theatre in Palm Desert Feb. 11, 2014 with her “Latin Roots” show – a tribute to her dad. Charles Dunn and Rob Piepho arrived from Palm Springs and I photographed them holding Tommy’s dog Shubert…a fitting name for a pup belonging to a theatre favorite. Carol moved from the terrace to a high director’s chair in the living room. Everyone gathered around her – old and new friends. Tommy told us that a crew had arrived with Frank Di Lella from NY 1 to do a televised interview with Carol and we all watched. Once more Carol delighted all with answers to questions about her start in show business, her friendship with author Thornton Wilder, and her adoration of composer/lyricist Jerry Herman. The crowd listened and applauded at the end. A young, very pretty girl looked at the Broadway legend in awe. Tommy introduced the girl to Carol. “This is Laura Osnes, who is playing the lead in Cinderella on Broadway, and her husband, Nathan Johnson,” he explained. Very slowly Laura started the opening lines and melody of “Before the Parade Passes By.” She was joined by her husband as they stood on either side of Carol, serenading her. Then one, two and maybe a half dozen singers chimed in as they walked through the living room to reach Carol. Channing was pleased and joined in – the center of attention as her voice rose above the others and, from her director’s chair, re-created, vocally, one of the show stoppers from Hello Dolly! We left the party before it was officially over and once more Carol, with Wayne assisting, made it down all 21 stairs. Sylvia, Carol and I returned to the Waldorf and ordered room service in the suite. We had the food brought into the dining room and kicked off our shoes (Carol kicked off her boots) and talked about the party. Carol was happy because she was with so many friends that she had not seen in a long time. The conversation became serious as Carol talked about her son and the sacrifices one has to make on the stage. I left the blinds up in my bedroom before I went to sleep. I always like to look at the New York skyline and its lights when I am in Manhattan. Carol and Sylvia were up enjoying the breakfast that Harlan brought from the private Waldorf Tower dining room when I joined them in the living room about 7 a.m.
Sylvia said we were all going to 21 for dinner. “Oh I love 21,” Carol said, adding that she hoped we could go down into the wine cellar where former Mayor Jimmy Walker had a romance with a well known actress and comedienne. Suddenly she looked at me, “Where did you find a night gown that small?” It was silk with embroidered tufts at the top. “You know I bought one for my son when he was six months old,” she said. When Sylvia, Harlan, Carol, and I arrived at ‘21’ that evening, Carol noticed changes since her last visit. “This is 21?” she asked. Of course it was – and she knew it. We were seated at a large circular table next to the bar. Carol had a wonderful time. We all did. I ordered steak tartar at one of the only restaurants where I knew it would be good. “Isn’t it wonderful? 21 has been here for so many years. It brings back so many memories,” Carol said. The entire group was going to Sardi’s the next day for lunch. “Please come with us,” said Wayne. We took a limousine back to the hotel. I packed for my departure the next day. What a marvelous time I had. What an overwhelming experience to see the love everyone had for Carol. I looked at Carol and realized the parade will never pass her by.